Visiting Umbria often means making new friends. Umbrians are apparently reserved yet ready to share with others their love for food, good wine and the nature of their region. We wanted to share with you some of the people and places we love. LINDA GALLETTI: Linda is a professional cook, but above all an enthusiast when it comes to sharing her recipes! 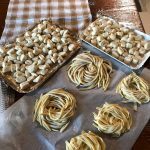 If you wish, you can learn to make fettuccine, gnocchi, lasagne and bread at home.